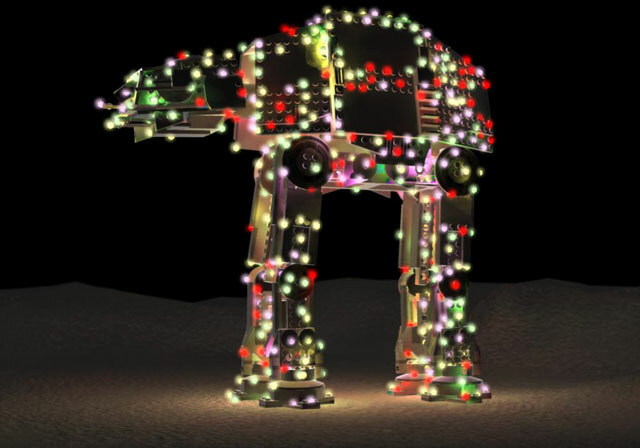 It�s time for the FBTB Star Wars Christmasification building contest! What? Christmasification is too a word, Don, look it up in the Becktionary. Christmasification is taking something mundane and normal, and putting a little Xmas cheer into it. How are we going to do this? One of two ways. So in truth, this is actually �two� building contests! 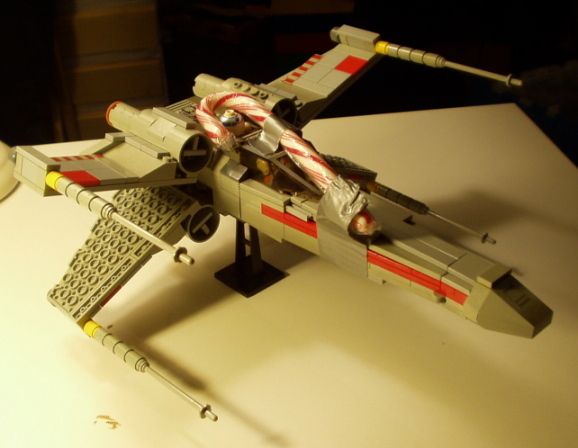 Contest One: Christmasify a Star Wars vehicle! It can be a starfighter, speeder, or even a capital ship, so long as it was seen in the Movies or the Clone Wars cartoons (so, no EU, custom, etc... and avoid something that was on screen for 3/10ths of a second, or especially obscure stuff). In here, size is no object. 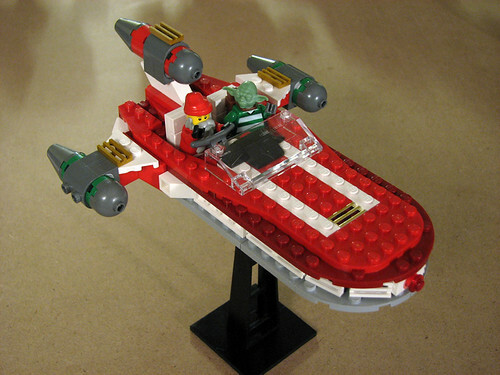 You can make it as big or as small as you like, so long as it�s minifig capable (meaning no minis, but if you choose a cap ship, it can be ISD scale) and captures a Christmas feel (or holiday-it-up, if you want to Hanukafy or Kwanzadizzle it). How do you do that? Well, that�s up to you. Maybe it�s a reindeer drawn A-Wing, a festive TIE Fighter, or a snowman AT-AT (Frosty the Planet Wrecker) or a sleigh-style landspeeder. The sky is the limit. So long as you capture a holiday feel, it will work out. The second contest you ask? A little holiday vignette! On this, the requirements are a little more relaxed� you need to include at least one movie character (though you can include more, or customs outside of that), you�re limited to a 12x12 base, and you can�t make up for the base size by building it eighteen feet tall (limit of, let�s say, 1 foot or so, if you feel the need). The vignette needs to capture a star wars and holiday feel, and can be as serious or as humorous as you like, just so long as it meets all of those requirements. 1st Prize, a 6211 Imperial Star Destroyer Playset! Special credit goes to Rook for sparking this idea in our heads! 1. New builds only. You can't just slap a few lights on your old MOC and say it's now Christmasified... you have to build something new! 2. You can only submit one thing for each contest. You can change it up until the cut-off date. If you post more than one, you'll be disqualified. 6. Quality counts. If your pictures are blurry, icky, or otherwise bad, the staff reserves the right to DQ you from the contest. This will be a rarity, but it doesn�t take much effort to make a good picture. 7. Official parts and stickers only on ships. "Custom" figures are allowed custom decals, but no slicing and dicing. /me internet high-fives the Uncapitalized d-inator. My personal thought is if you submit a virtual entry you should only get a virtual prize... and since dW and Ry have been awesome enough to provide physical prizes, only physical entries should be considered. But don't let that stop you from using CAD programs to design your entry. For those of you who have been keeping tabs, this is not *THE* contest you've heard mentioned off and on that will kick off the new site. That's still waiting in the wings; Nick and the rest of the staff just wanted to get something out before the end of the year, and the idea was a good one. When you say 'limited to' a 12x12 baseplate, do you mean that that is as far as we can go, or that that is the size it has to be? That's the max size. If you want to go smaller, feel free. Ah, okay. So, how would we submit these? In SW Mocs, or in this thread? I'm so on this mine is already built. But I has question too. Can there be a small amount of overhang from the 12x12? just a little bit? I've completely forgotten the right word to use. The over hang is not substantial, but the effect is the best thing ever. When it gets a bit closer, we'll put a submission thread in here. For now, if you want to post, you can make a MOC thread and get feedback. As for overhang (and already being done), remember the "no existing builds" rule. As for the overhang, there's a baseplate restriction. What you put above it is your business, unless it's obvious you're just trying to cheat the rules. It doesn't already exist, I built it the moment I saw the competition for a holiday vignette. And cool, I'm not trying to cheat, it's not that huge an overhang. It's small and wee. I'll post pictures soon anyway. K, just wanted to make sure. Also, as a note on the vignette base... 12x12 is the max size, and there isn't a requirement on what the base is made of. You can construct the base however you like, so long as it fits the size requirement. The Batman base was just a suggestion. Why can't we have a Kwanzaafication or Hanukkahfication contest? Sounds like a fun contest. And I'm glad to see that we have a new contest (or two) It's been awhile. Heh heh heh, I like this contest. Pepa, that's a great example of what we have in mind here. Thanks for posting it in the thread. There goes my first idea. Anyways awesome contest idea you guys! I forgive the illegal part usage here, but the rules clearly stipulate it has to be a new MOC. There's no crime in someone submitting the same ship/vehicle as you... part of this contest is to be festive and show off your building chops. That ISD is the #6211 set, correct? Are we allowed to use photoshop? To crop, size, and label photos, yes. To add the Chrismasification elements or change the build... no. Bits of flair can be handled on a case-by-case, but the best builds use bricks. To clean up images, yes. We encourage that. To alter the MOCs appearance, no. Like, you can edit out stands and cat hair, fix contrast, add effects... the usual stuff. But don't go adding details that aren't on the MOC or changing part colors. That's on par with modifying parts. Just use common sense here. When in doubt, don't do it. edit: curse you're quick fingers Nick! edit again: ok, Nick wasn't all that quick. Guess I stepped away longer than I thought. My thoughts still apply.